These premium hose insert fittings are manufactured in the USA using the highest quality materials for high performance and longevity. Premium PVC insert fittings ensure a reliable connection with Layflat and Blue Stripe® Oval Hose. 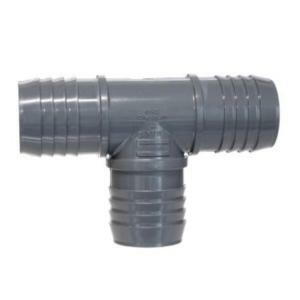 The specially engineered barbs fit deep into the tubing wall for a strong, slip-free connection when paired with any of our corrosion resistant hose clamps of acceptable size. Use with Layflat and Blue Stripe® Oval Hose as sub-main and main lines for water transfer and drip irrigation. Larger sizes are assembled components.